Warner Bros. is teaming up with DC and Nickelodeon for a crossover film based on James Tynion IV and Freddie Williams II’s Batman/Teenage Mutant Ninja Turtles comic book series, SyFy Wire reports. 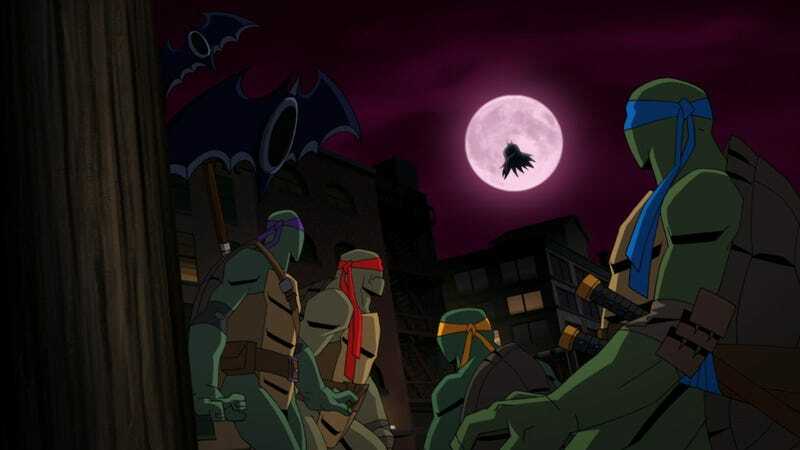 Called Batman Vs. Teenage Mutant Ninja Turtles, the film will find the heroes in a half-shell shrugging off Shredder to square off against a slew of notable Batman villains. “Batman and Michelangelo exist in the same world?” you ask. No, silly, a “dimensional warp” is responsible, so, please, for the sake of synergy, ask no further questions. Joining Leonardo, Donatello, Raphael, and Michelangelo will be not just the Caped Crusader, but also Robin and Batgirl, the latter of whom is voiced by Crazy Ex-Girlfriend’s Rachel Bloom. Bloom’s not the only big name here, either. The all-star cast also includes The Assassination of Gianni Versace’s Darren Criss, who, along with Kyle Mooney, Baron Vaughn, and Eric Bauza, will lend his voice to the teenage reptiles. SpongeBob’s Tom Kenny and Futurama’s John DiMaggio will voice The Penguin and Mr. Freeze, respectively, while journeyman voice actor Troy Baker will, as he’s done in a number of video games, lend his voice to both Batman and The Joker. Harley Quinn, Bane, Poison Ivy, and Ra’s al Ghul will also be on hand. The animated film swoops into your eyeballs sometime this spring.